Visit superb seaside resorts and enjoy picturesque scenery with car rental Caen! Complete the search form now to get car rental Caen at the lowest rates! Car rental Caen is your connection to the wide choice of car hire vehicles to meet your car rental budget. We compare prices of the chief car rental companies to find the best car rental deals for you! Make your staying in Caen truly relaxing, safe and comfortable with high quality cars from leading suppliers and dedicated customer service that provides car rental Caen! Choose the desirable Caen car rental location and check Must Know and Places to Visit with car rental Caen! Caen is the administrative center of Lower Normandy. This city, located 12 km away from the sea, is interesting for its history and amazing architecture. 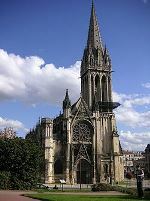 In the mid-11th century, Caen became the preferred residence of William the Conquerer and Queen Matilda, and the beautiful twin abbeys they founded still remain, along with eight old churches. Without exaggeration, we can say that architecturally Caen is one of the most interesting cities in Northern France. Carefully, lovingly restored after the Second World War, this old French city has turned into a refined center of tourism. Traffic signals are usually located on the right-hand side, on the sidewalk, instead of overhead in the middle. Solid white lines demarcating an intersection indicate a stop, even in the absence of a stop sign. A turn-indicator light to French drivers is not a request but indicates an immediate maneuver. It’s illegal to drive on side (parking) lights at any time. It’s also illegal to use full beam when you’re following a vehicle or when a vehicle is approaching from the opposite direction. Failure to dip your lights can cost you a penalty point on your license. 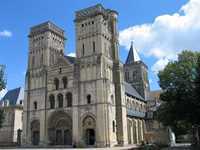 William the Conqueror and his wife Matilda founded two abbeys in Caen, one for men and one for women, in expiation of their uncanonical marriage as they were cousins. 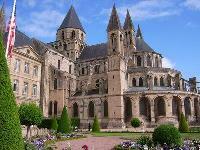 Matilda's abbey, the Abbey-aux-Dames, was founded in 1062 and dedicated to 1066, the year her husband conquered England. The queen was buried in the choir in 1083. 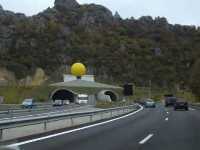 Visit this amazing place with your car rental vehicle. Also don’t miss the opportunity to visit the Abbaye-aux-Hommes, which was founded by William the Conquerer in the 11th century as penance for marrying his cousin, Matilda. The Conqueror himself was buried in the church. Additions to the abbey were made in the 18th century and its elegant buildings are now part of City Hall. Visit the castle that dates back to the 11th century using your car rental vehicle. 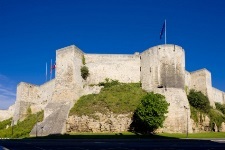 Caen Castle was begun by William the Conqueror and is one of the most imposing buildings in the city. The castle has a series of exhibitions open to the public. 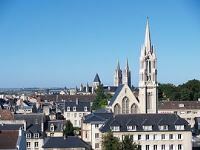 Get your car rental Caen to visit St-Pierre, which was built on the south side of Caen Chateau in the 13th and 14th centuries and is a fine example of the transition between Gothic and Renaissance forms. The church is best known for its 75m (245ft) tower of 1308. The interior features an elegant Gothic nave and an elaborate Renaissance apse, with rich decoration and unusual vaulting. RentalCars24h.com offers you reliable car rental Caen services that will help you to feel free and independent when moving around the town. Providing best online prices for car hire Caen services, RentalCars24h.com allows you to save money each time when you rent a car in Caen.